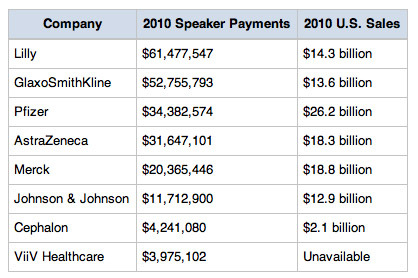 The pharmaceutical industry has been very generous in making payments to physicians. Last year (2010), for example, a mere dozen pharmaceutical companies paid $760 million to physicians and other health care providers for consulting, speaking, research and expenses, according to ProPublica's "Dollars for Docs" project. ProPublica has taken "translucent" -- ie, difficult to analyze -- data reported by pharmaceutical companies and created a single database that makes comparisons simple (see here). The database contains information about payments made to about 500,000 doctors. That's about half of ALL doctors in the US (including Peurto Rico). That works out to about $1,520 per doctor (or about $760 per EVERY doctor in the US), on average. 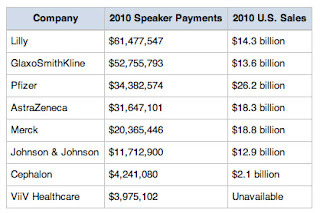 Of course, some doctors were paid MUCH more than this -- eg, pain specialist Gerald M. Sacks raked in $270,825 from Pfizer, Johnson & Johnson, Lilly and Cephalon in 2010, up from $225,575 in 2009. And some doctors received only $50 for lunch. At least 20 doctors, however, received "meals worth $2000 or more from Pfizer between July 2009 and March of this year," said ProPublica reporter Charles Ornstein. According to the ProPublica database, Pfizer paid my doctor -- Catherine Spratt-Turner -- $388 for meals and $1,500 for speaking in 2010. This worries me because she wants me to come in and discuss my high cholesterol. Apparently, generic pravastatin is not doing the job and I suspect she wants to switch me to another anti-cholesterol medication. Will she suggest Pfizer's LIPITOR? I'll let you know when I see her. Previously, she was hot to get me on AstraZeneca's CRESTOR, which I resisted because of its published side effects. BTW, Spratt-Turner did NOT get any money from AZ last year. This is exactly what worries some physicians who receive payments from pharmaceutical companies. As more and more searchable data becomes easily available to the public, they fear that patients will rebel and resist their advice if it appears that payments are influencing that advice. Oh, well! Welcome to the social media age! 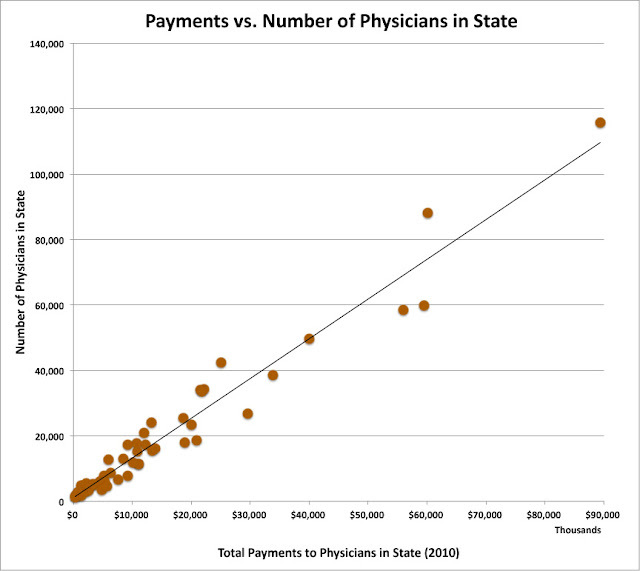 Overall, it appears that pharma companies tend to spread payments among physicians such that there is a more or less direct correlation between the number of physicians in a state and the amount of payments made to physicians in that state (see chart below). Of course, $760 (or $1,520) per every physician is not going to improve a physician's lifestyle very much (although I am sure YOU and I would be happy to have an extra thou to spend every year!). No, this money is central to what I call pharma's "prescribing recovery act" designed to grease the drug prescribing economy. [This post originally appeared in Pharma Marketing Blog.